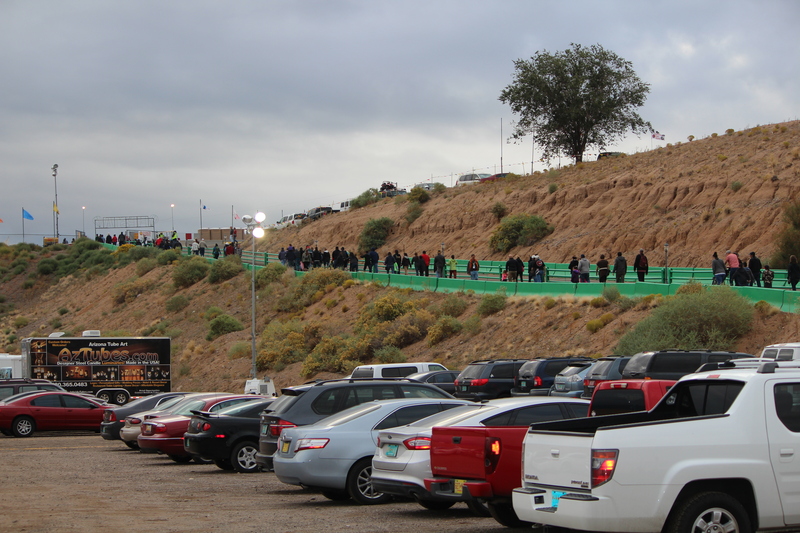 10 things to do if balloons don’t rise: Albuquerque’s Balloon Fiesta | Oh, the Places We See . . .
OK. So you’ve read our other four posts showing the glorious skies over Albuquerque filled with colorful balloons, and you really, really want to see this phenomenal event for yourself. But bear with us as we bring reality to you: Not all sessions at the Albuquerque International Balloon Fiesta have successful lift-offs. We know it’s sad. But it happens. See that yellow flag in the distance? That’s what you watch to see if it turns to red, calling off the Balloon Fiesta session. We attended two afternoon sessions only to leave both of them with no balloons in flight anywhere. Here’s the deal. Balloon Fiesta officials fly a flag on Main Street. Green means all conditions are favorable for lift-off. Yellow means something may be afoot, and you need to watch the weather carefully. Red, however, indicates the whole event — well the balloon part, at least — is a No Go. Weather happens, you see: high winds, rain, you name it — safety comes first in launching balloons, and we respect that. Sometimes you just have to make that long trek back to the parking lot without seeing a single balloon rise. But don’t worry. There’s lots to do while you wait and see. 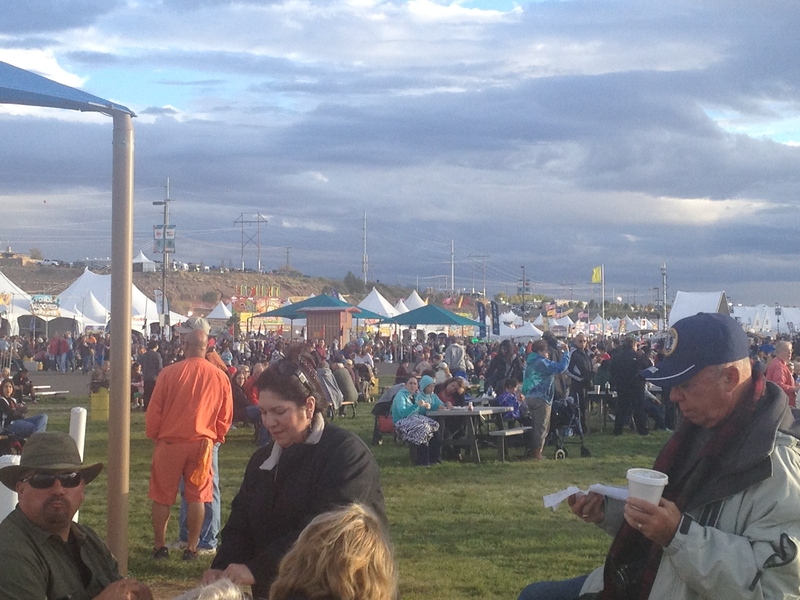 So, what do you do at Balloon Fiesta when balloons don’t fly? Well, as it turns out — a lot! Here are some first-hand activities that we enjoyed balloons or no balloons. 1. Watch strong guys carve wood. 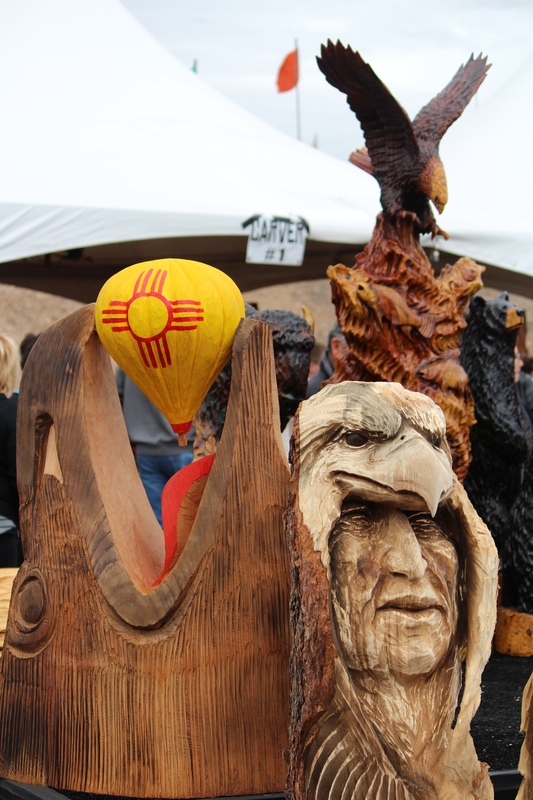 The AIBF Chainsaw Carvers Invitational sets up at the end of Main Street. 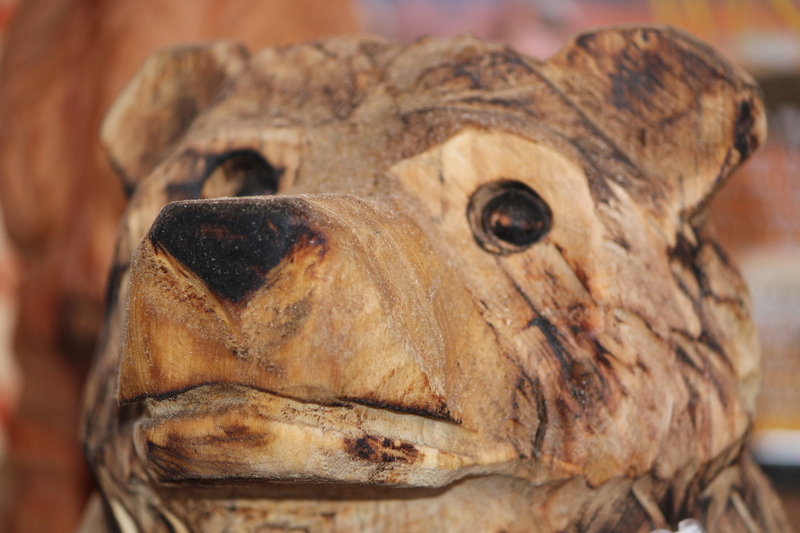 And if seeing hot, tired, on-their-feet-all-day creative carvers isn’t enough, you can also bid for one of their wood creations. 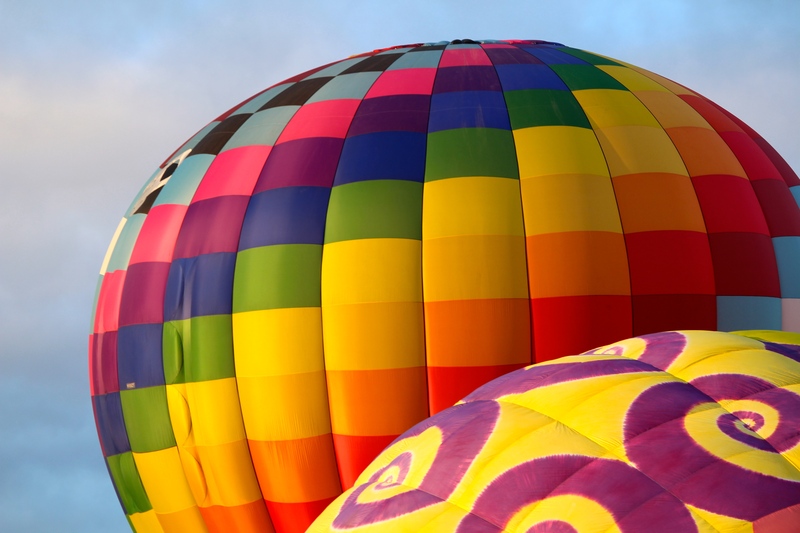 From bears to eagles to New Mexico balloons, it’s a sight worth seeing! 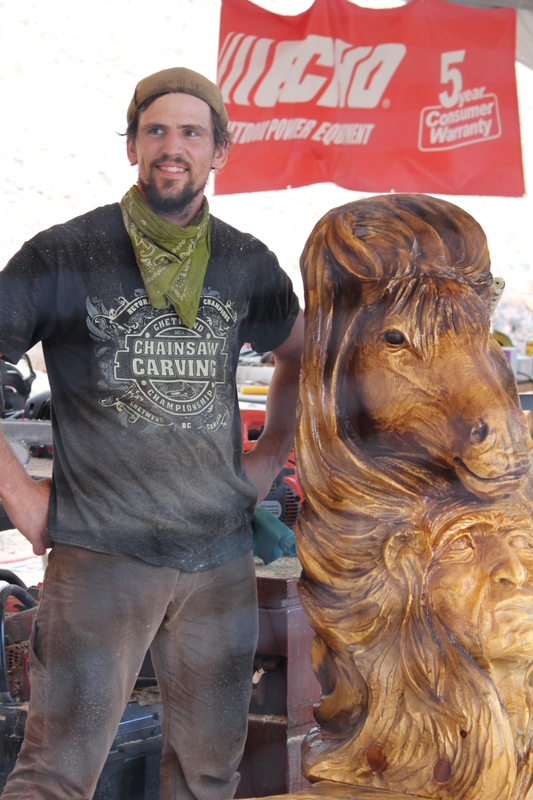 Chainsaw Carver standing by his finished product right before judging. Wanted to take this bear home! 2. Pose for pictures. 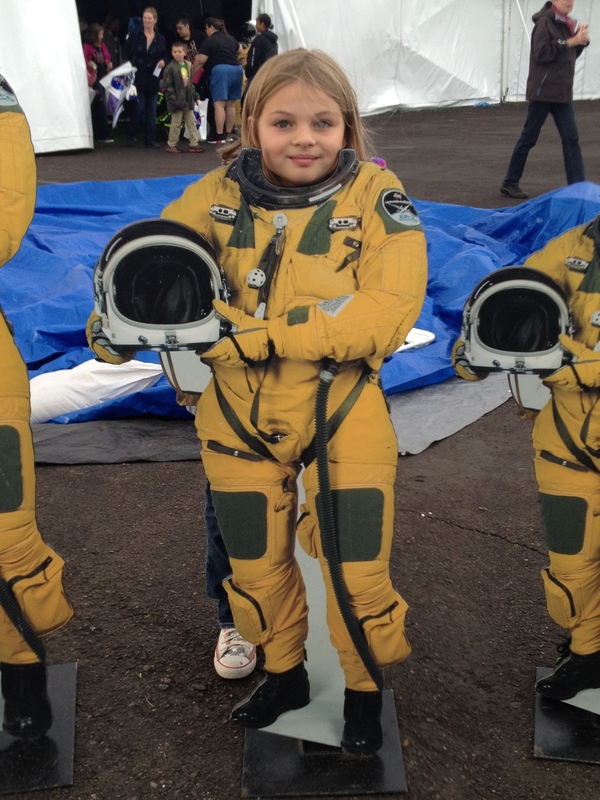 Let your kid be an astronaut or be a kid yourself and gather round these strategically placed boards throughout the park. After all, you know you want to send Facebook pics to the folks back home! Bert, can’t you get anyone to pose with you? 3. Buy something. 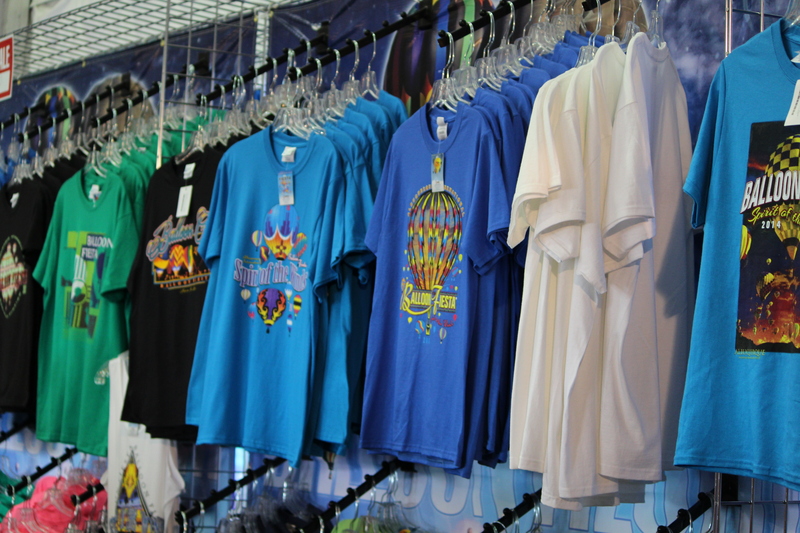 Big tents hold the latest t-shirts as well as key chains, pens, and patches to sew on your blue jean jacket. And most of the stuff you can put on right there in the makeshift dressing rooms and wear out to the field! Since both afternoon/evening sessions we attended were called off, we never saw Balloon Glow — a lineup of balloons all lit up at once! A t-shirt might be the next best thing! 4. 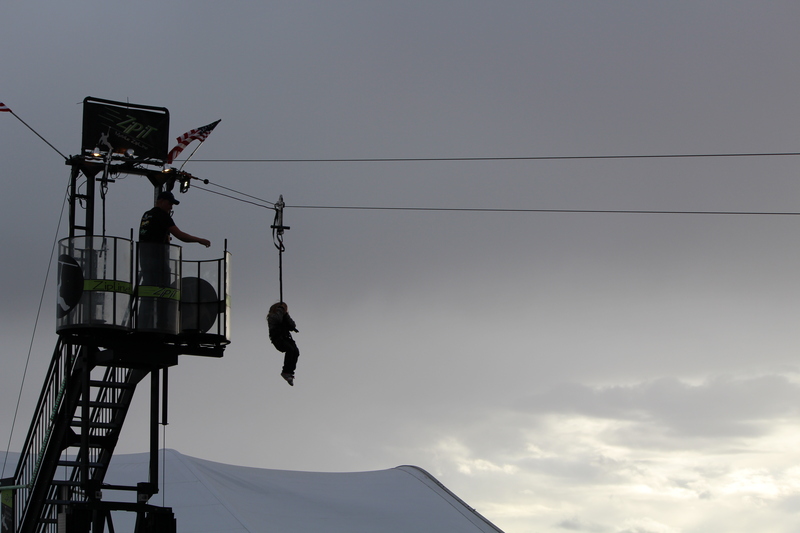 Zipline above the crowd. 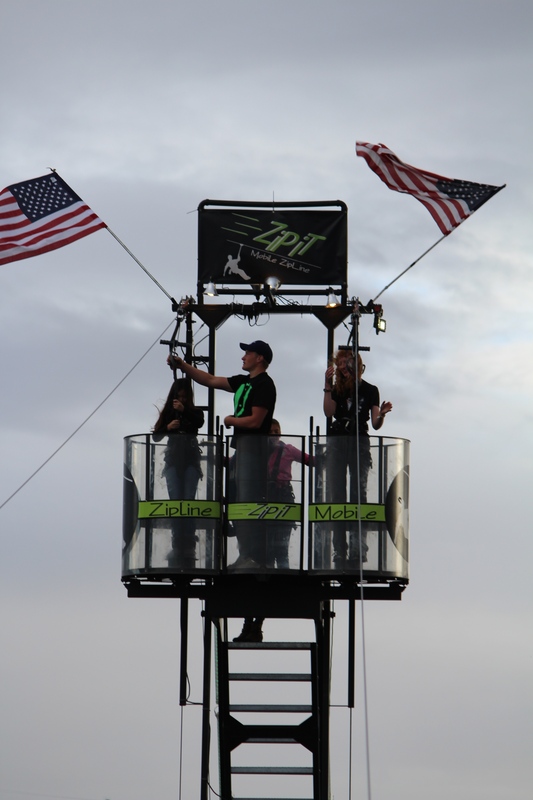 The ZipIt crew will strap you in and send you off into the clouds. They won’t, however, hold your hand. You’re on your own for that! Ready to set you up for a zipline experience to remember! Getting a view of the launch field from a zipline! 5. Walk on water. Looked like fun to us, but don’t ask us for a first-hand testimonial. 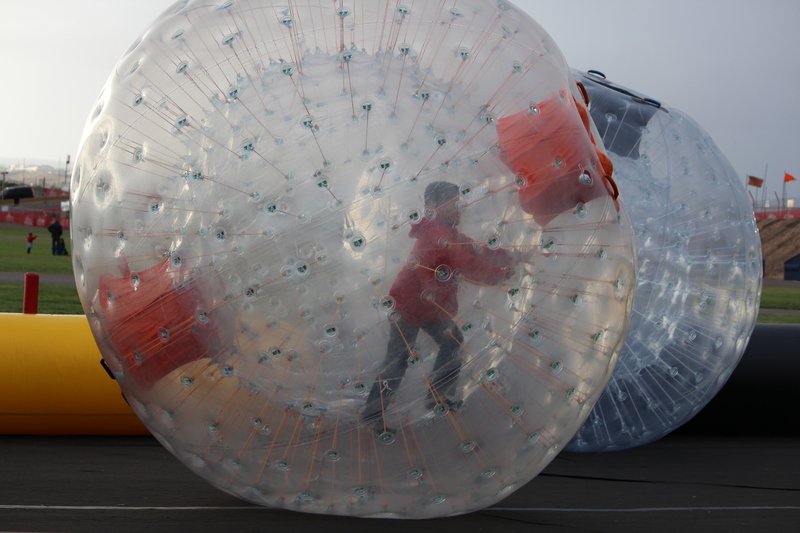 You climb in a big see-through ball and roll around in a water-filled pit. Fun for some. Or at least it sounded like it! Just as the sign says: Walk on Water! 6. Be entertained. With a big stage and ground-thumping sound system, you can pretty much hear the line-up of musicians all over the area. And see the live screencast from the field. 7. Collect pins. Now, I normally don’t take pics of people’s chests, but Bernadine was quite proud of all the commemorative pins she had collected over the years. In fact, as of October 2014 she hadn’t missed a single Balloon Fiesta! 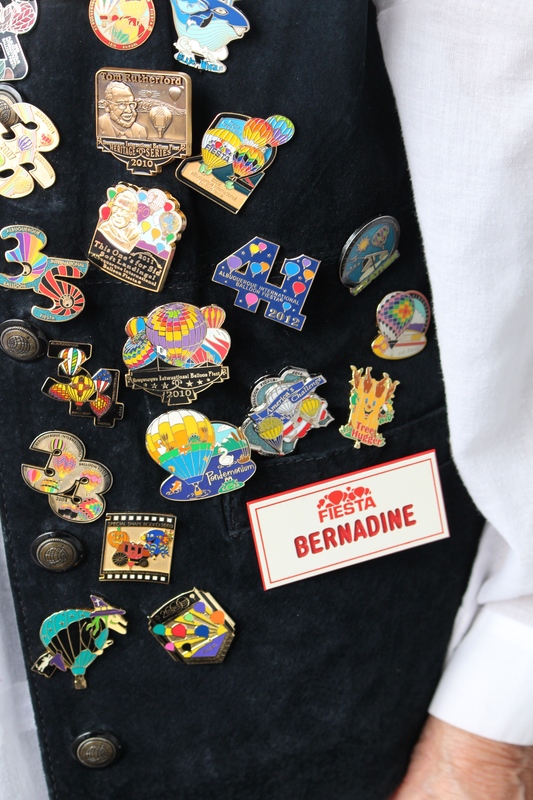 Bernadine’s been to all Balloon Fiestas — and has the pins to prove it! 8. Eat hearty. We love festivals, hometown celebrations, and anything local where you can find foods of the area. 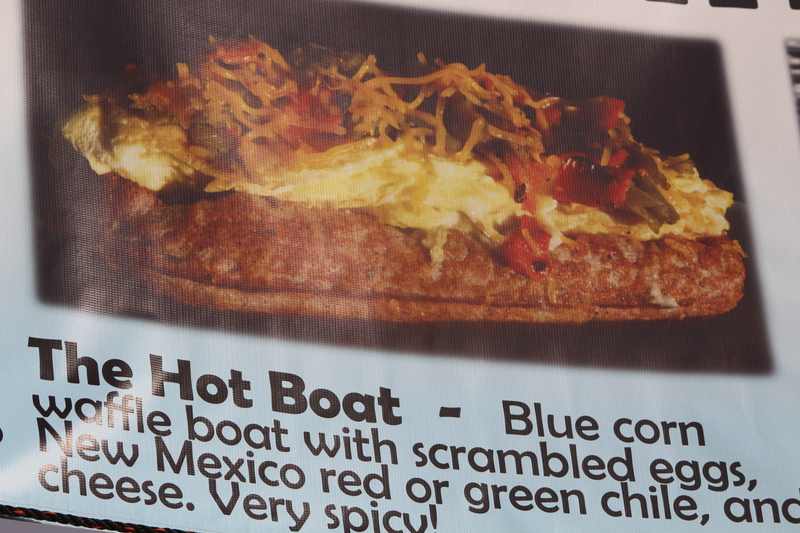 We don’t know if The Hot Boat and a Lotaburger qualify as gourmet samplings or even a representative taste of New Mexico, but we wanted to try them anyway! It’s hot all right: The Hot Boat at Balloon Fiesta 2014. 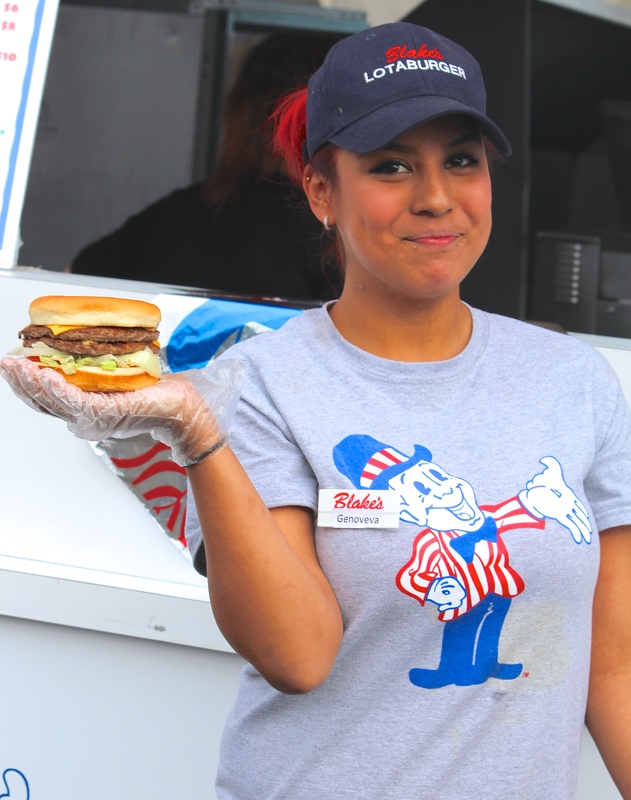 Wouldn’t you want to buy a Blake’s Lotaburger from this young lady?! 9. Thank the folks in charge. 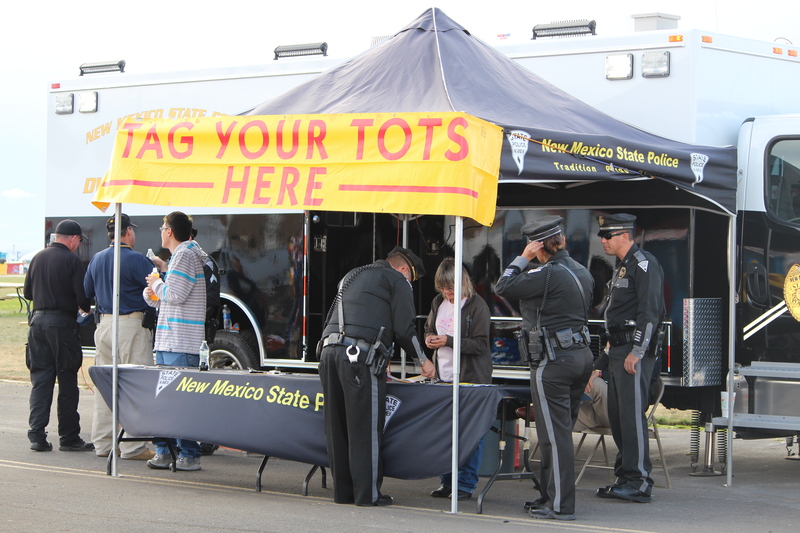 At every turn, there were police officers, paramedics, volunteers, etc., who made sure Balloon Fiesta was safe for the thousands of onsite visitors, hoping for a good time and nothing more. 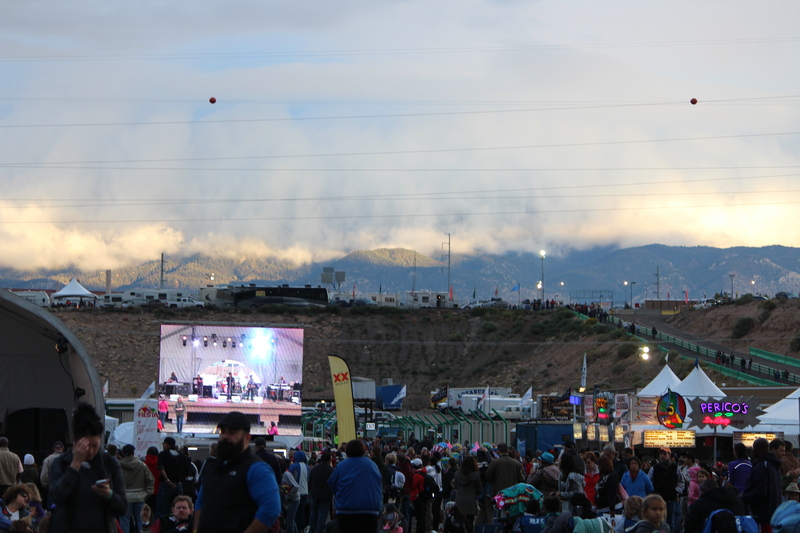 So grateful to those who want to make Balloon Fiesta a safe place for kids! 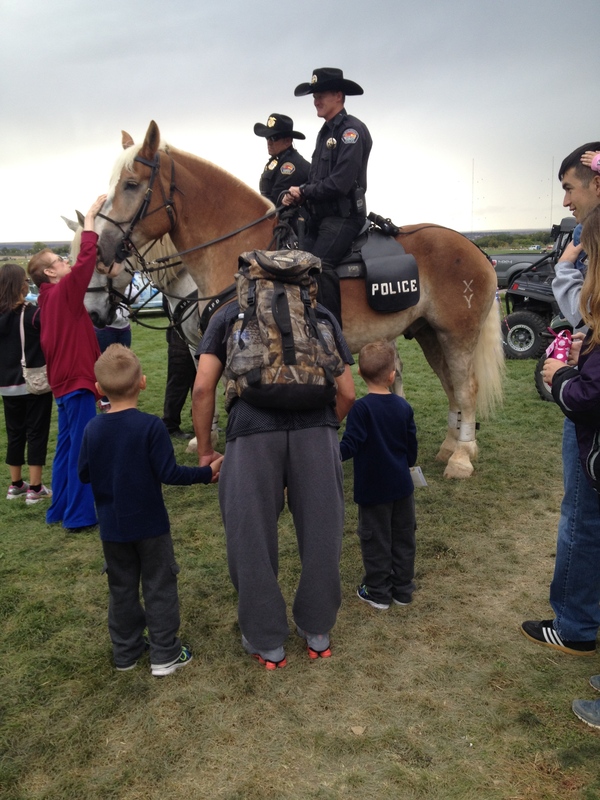 Approachable, too — the police on horseback allowed visitors to meet and greet. 10. Watch the weather. As we said before, weather conditions change rapidly. On one of the afternoons we were there, the flag changed from green to yellow to red in just a couple of hours. And you never know, you may make be lucky enough to catch a rainbow. 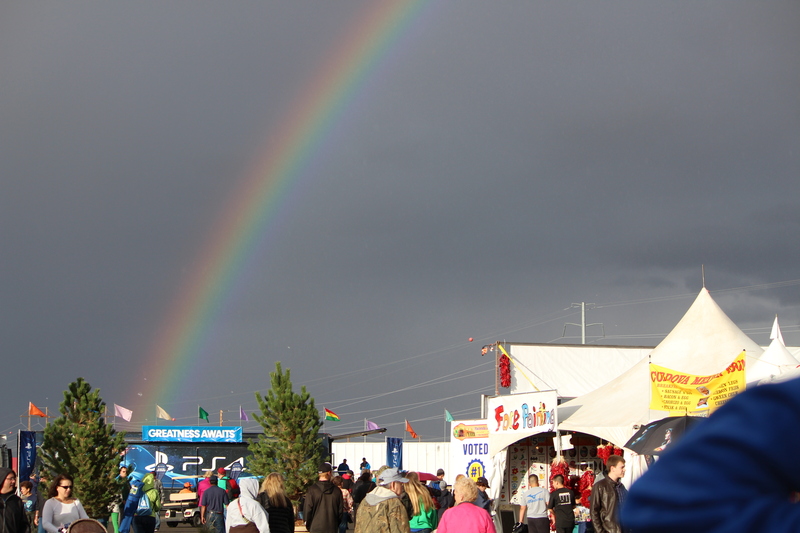 Greatness Awaits says the sign under the rainbow. And you never know . . . balloons may go up or not. 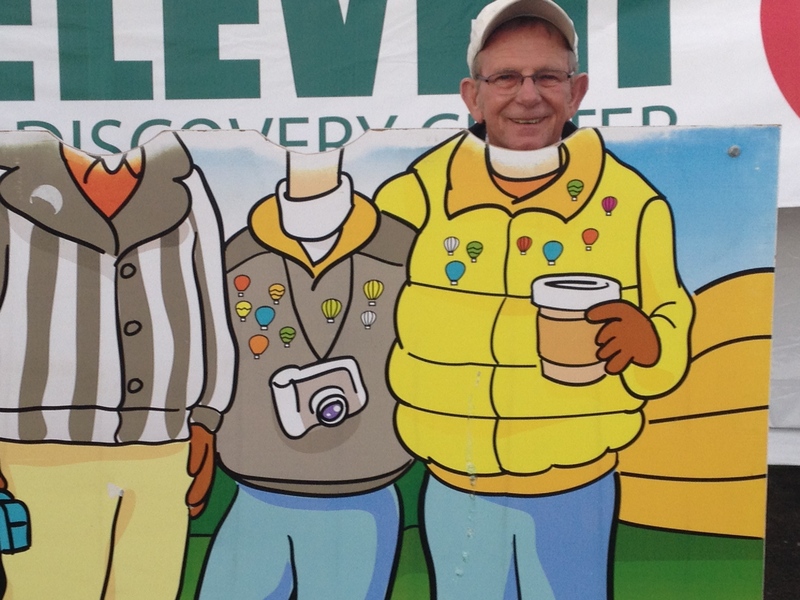 Balloon Fiesta’s fun anyway. Best wishes for great lift-offs while you’re at Balloon Fiesta. But if balloons don’t rise, just know this: you’ve got lots of options! For information on getting a refund when weather cancels a session, go here. This entry was posted in Festivals, New Mexico, Travel and tagged Albuquerque, Balloon Fiesta, Blake's Lotaburger, Chainsaw Carvers, collector pins, New Mexico, Walk on Water, ZipIt. Bookmark the permalink. So very true, Curt. We now know that you have a 50/50 chance of seeing balloons rise. 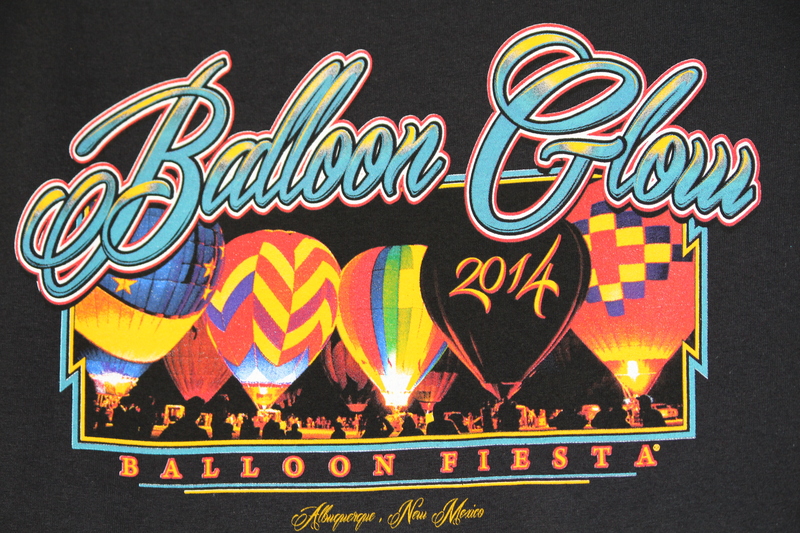 We’re sorry we never saw Balloon Glow, however — only occurs at night, and both of our night sessions were halted. Guess we have to go back! Thanks for taking a look. You definitely have to go back. If Burning Man is any example, the world at night is totally different that the world of the day. I do hope you’ll get a chance to attend Balloon Fiesta. With your love of photography, you’d be in balloon heaven!